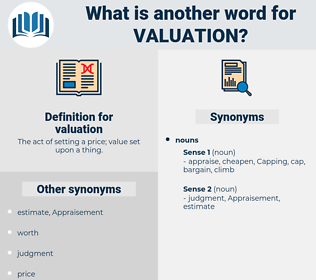 What is another word for valuation? 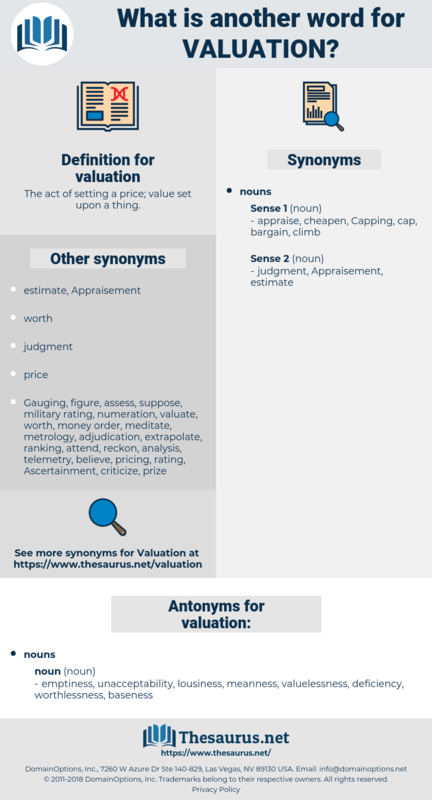 The act of setting a price; value set upon a thing. Criteria, evaluators, results, paragraphs, valorisation. evaluator, valorisation, depreciation, inventory, reclamation, audits. write-downs, appraisal, appraisals, Valuing, assess. Valorization, appraisal, titration, estimates, Valuing, recoverability, beneficiation, appraising, judgement, recoverer, assess, characterization, optimisation, esteem. emptiness, unacceptability, lousiness, meanness, valuelessness, deficiency, worthlessness, baseness. There was not a trace of male anger or demand in the gaze but a cold valuation of me and the entire situation that burned me as ice burns raw flesh, then over all of us there suddenly poured from the same source a tenderness that was as radiant as the summer sun. Of course scales would not have indicated this loss of weight, for the weights used would have lost precisely as much as the object itself; but a spring weighing - machine, the tension of which is independent of attraction, would have given the exact valuation of this diminution.